This article provides tips about the pitfalls and advice that will help you to make your first process mining project as successful as it can be. By Anne Rozinat, Fluxicon & Frank van Geffen, Rabobank. Process Mining is much more than the automatic drawing of process models. Process mining is on the rise. By using Process mining, organizations can see how their processes really operate . The results are amazing new insights about these processes that cannot be obtained in any other way. However, there are a few things that can go wrong. In this article, Frank van Geffen and Anne Rozinat give you tips about the pitfalls and advice that will help you to make your first process mining project as successful as it can be. Process mining doesn’t usually begin as a top-down initiative. Typically, there are a few enthusiastic people who want to do something with it. 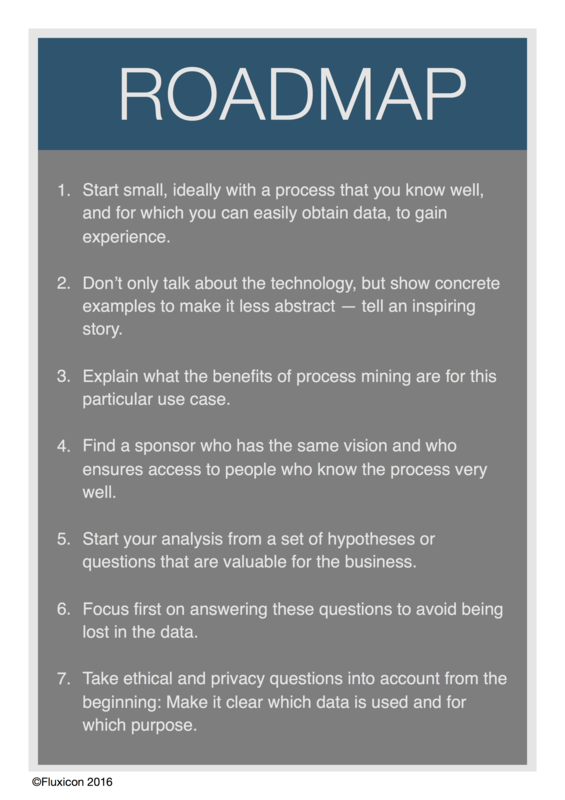 When they start a process mining initiative within their organization, they need to bypass the following classic pitfalls. First of all: Being too fascinated with the technology itself can lead to an inability to show the added value from a business perspective. Secondly: An unrealistic image of the data availability, coming from the promise of Big Data, can lead to overblown expectations. And the third pitfall: Due to a wrong understanding of what process mining can do, the first project is often too ambitious in scope. Too much is being promised and it takes too long before the first results can be shown. This undermines the belief within the business that process mining produces a good ROI. A failed project then not only leads to a decrease in the entrepreneurial and innovative spirit among the process mining enthusiasts, but there is also the risk that process mining will not be picked up again in a new project for years. So, how can you make sure that your process mining initiative is successful? What makes the difference between success and failure? We provide you with a roadmap (see Figure 1) and discuss four success factors. Do: Define the business value in terms of effectiveness (customer experience and revenue), efficiency (costs) and risk (reliability). Determine into which process aspects you want to gain insights. To which business driver does this insight contribute? Better customer experience, cost reduction, risk mitigation? Don’t: Don’t be overly fascinated with the possibilities of the technology. There are often multiple ways to get answers for your questions, and sometimes multiple data analysis techniques must be combined to get the full picture. 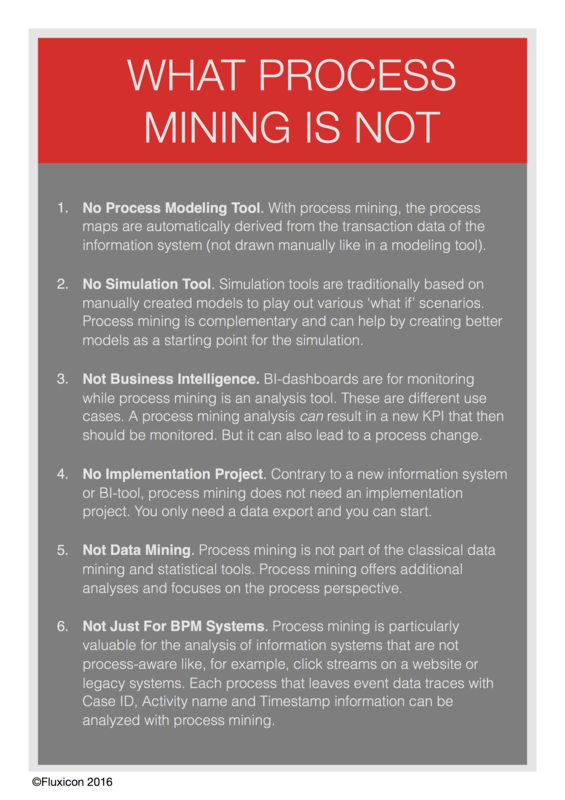 Do not become fixated on ‘only’ using process mining. Do: Connect the business driver to a specific business domain. Choose a process where the beginning and the end are clearly defined. Check whether this process is supported by an IT system. For example, call center or service desk processes are very suitable for a first project, because the data can be easily extracted from these systems. Also workflow systems are a good source of data for your process mining project. Each manager of such a process will benefit from insights that help to reduce costs or increase the effectiveness. This allows sponsorship on the management level. Choose a sponsor who is willing to support you (a sponsor who crosses their arms and says “Surprise me” is a red flag). And while you think about the possible use cases and application possibilities, also make sure to communicate what process mining is not (see Figure 2). By indicating clear boundaries, you can manage expectations on what it is. Don’t: Do not start with the most important core process of your company. That will come later once the first results have convinced people of the approach. For example, don’t choose the production and supply process of your beer company for your first process mining process. Instead, start with the purchasing process. You will be amazed about how much value is added to the primary process through an effective and efficient purchasing process. Do: Divide the main business driver into sub hypotheses that you can confirm or disprove with a process mining analysis. For example: There is a gut feeling that this service process takes too long. How long does the process really take? How much does it deviate from the expectation? Where are the bottlenecks that cause the delays in this process? In practice, measuring and making the actual throughput times visible already provides an insight over which the ‘business’ loses sleep. In addition, you can then indicate where exactly the delays are in the process. Take your business stakeholders from insight to insight. Stimulate them to ask questions. Explore, analyze and innovate. Time-box the intermediate results and the project. Eight weeks for the first project is usually a good aim. Don’t: Do not try to immediately answer all questions. The first insights often raise further questions, which then require further analysis. Avoid the pitfall of wanting to answer all possible questions beforehand (analysis paralysis) and use your initial hypotheses as a guideline to avoid being lost in the data and its possibilities. Do: Process mining allows you to analyze processes based on facts instead of subjective opinions. Speak openly and transparently about the data that you use and about the facts that come out of this analysis. This can be confrontational and for some people even unwelcome. Put a change management team together that has the competency to handle resistance. For example, you can integrate process mining in a project, where the Lean philosophy is used. In these types of projects, people are stimulated to tell each other the ‘truth’ and, therefore, are enabled to tackle and solve the real problems. Process mining can be the perfect assistance in this truth finding. Always use experts from the business process domain and the IT-domain for a sanity check of the data and the analysis. Use process mining as a constructive starting point to ask the right questions and avoid too quick judgments. Don’t: Never be careless in handling, preparing and analyzing the data. If you skip the data quality checks and present conclusions based on data that turns out to be wrong, you will often lose the trust of the business forever. Do not assume that all the information is in your data (often relevant context information needs to be considered to draw the right conclusions). Do not draw forced conclusions based on incomplete data (if your questions cannot be answered based on the available data, say so) and do not present anything that cannot be supported by facts. Because of all these challenges you can sometimes lose track of the great possibilities that process mining provides. But don’t despair and look forward to an exciting journey! Process mining is much more than automatically creating process models . Think back to the time before the invention of spreadsheets: People had to calculate everything manually, with a calculator. With the introduction of spreadsheets it was suddenly possible to do the manual calculations automatically. But that wasn’t the essence. You could do much more. For example, you could create financial projections for ten years in the future, which simply wasn’t feasible before. Process mining is as revolutionary for processes as spreadsheets were for numbers. With process mining it is now possible to look at your processes at a much more detailed level. You connect to the real processes and you analyze them based on facts. And after each process change, the analysis can be repeated quickly and easily. You will be amazed by what process mining can do! Frank van Geffen is Business Consultant Advanced Data Analytics at Rabobank (Frank.van.Geffen@rabobank.nl) and president of the Special Interest Group (SIG) Process Mining in the Dutch IT industry association Ngi-NGN. Anne Rozinat is co-founder of the process mining software company Fluxicon (anne@fluxicon.com) and board member of the SIG Process Mining at Ngi-NGN.